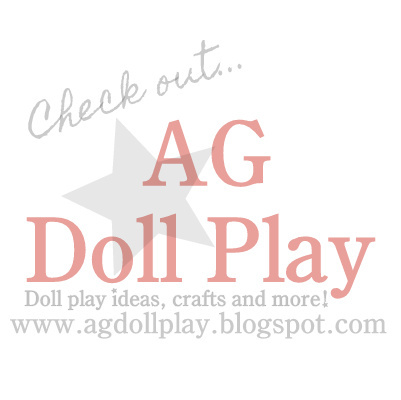 American Girl Doll Play: Making an Earring Tree for Your Dolls! Making an Earring Tree for Your Dolls! Zoey has two dolls now that have their ears pierced, her Elizabeth doll and a recent doll that my friend Amanda picked up for her while at the American Girl Benefit sale ($30!!) whom she named Claire. Having dolls that have their ears pierced meant that we had to get a set of earrings so they could switch out styles as needed so now we have a couple of sets of teeny little earrings to keep track of. I had been eyeing the earring tree that American Girl has but it comes with a storage tower and a steep price tag of $85 which A) the storage tower is something I simply do not need right now and B) the price is something I am definitely not willing to pay for just an earring tree! That meant only one thing...figuring out how to make an earring tree of my own, easily and for cheap! This past weekend I had a little crafty time on my hands so I attempted to make an earring tree using some sheets of fun foam, hot glue and a small dowel. I originally had thought of making the earring tree a tree and then thought perhaps a heart or star but then I looked at the doll bedding that Zoey has and was inspired to make an owl shape (you can see the bedding in a picture later on in this post). I know they make super thick sheets of foam but I didn't have the thick kind so I stacked 4 sheets together for the base and for the owl after cutting out the shapes needed. I drew my shape on the foam until I was happy with what it looked like and then cut out 4 pieces of each shape, in my case...4 ovals for the base and 4 owl bodies. I cut a white strip of foam to glue around the oval base so it looked more finished. I also spray painted my little dowel white. It doesn't look perfect by any means but it's cute and fun looking and matches Zoey's doll bedroom and will serve a definite purpose! 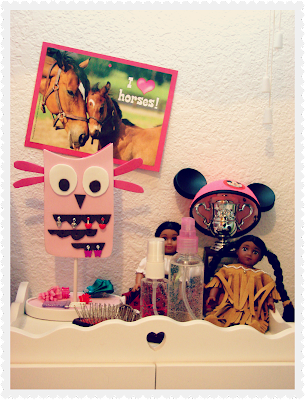 I poked the holes in the owl using a big tack and then punched through using the doll earrings. The bottom will actually serve nicely as a little catch all for little hair clips too I think. You can see my finger nail marks here on the foam but they have since disappeared. I wanted to share a close-up of the earring holes. Do you see where I got my owl inspiration from? I think I might try and find some small white ribbon to glue around the owl completely so that you don't see the stacked foam pieces...we'll see. For now it does the job! Here it is in it's new home in the doll bedroom. It's on top of their closet along with their dolls, trophy, Disney ears and hair care items. Let me know if you try this at home for your dolls! I would love to see different versions! That is awesome! Nicely done. Thank you for sharing. Thanks Melody!! We are so happy to have a "safe" place to keep those little earrings! Oh. My. Gosh. This is absolutely adorable!!!!! This is so cute! I will definitely make one; we lose the little earrings all the time! Where did you get the doll mickey ears? I'm going to Walt Disney world in February! Too cute! I'm going to make one, but in a different shape, later and post to my blog. I'll of course show where i got the inspiration. I don't have bedding yet though, so i'll just make a heart or something.